VIDEO: What is the Great Pacific Garbage Patch? What and Where Are Garbage Patches? There are five gyres in the ocean. One in the Indian Ocean, two in the Atlantic Ocean, and two in the Pacific Ocean. Garbage patches of varying sizes are located in each gyre. 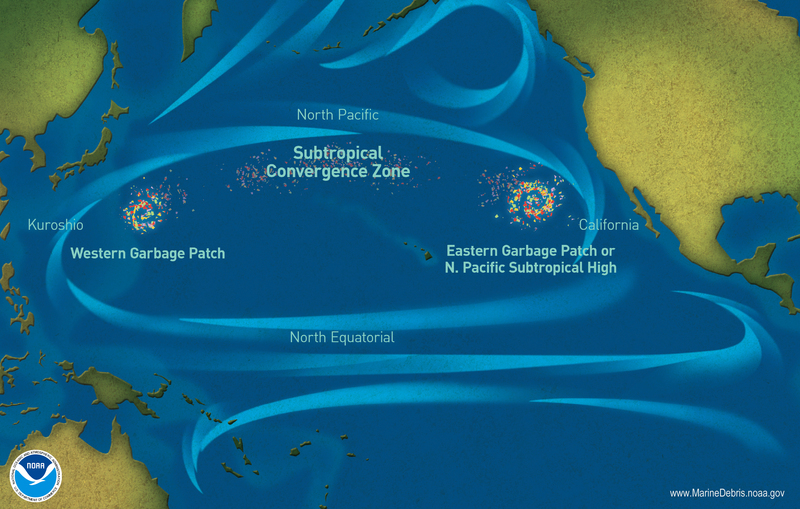 The most famous of these patches is often called the “Great Pacific Garbage Patch.” It is located in the North Pacific Gyre (between Hawaii and California). “Patch” is a misleading nickname, causing many to believe that these are islands of trash. Instead, the debris is spread across the surface of the water and from the surface all the way to the ocean floor. The debris ranges in size, from large abandoned fishing nets to tiny microplastics, which are plastic pieces smaller than 5mm in size. This makes it possible to sail through some areas of the Great Pacific Garbage Patch and see very little to no debris. The Great Pacific Garbage Patch is in the Pacific Ocean between Hawaii and California. It is the most well known patch. While some areas of the patch have more trash than others, much of the debris is made of microplastics (by count). Because microplastics are smaller than a pencil eraser, they are not immediately noticeable to the naked eye. It’s more like pepper flakes swirling in a soup than something you can skim off the surface. You may come across larger items, like plastic bottles and nets, but it’s possible to sail through some areas of a garbage patch and not see any debris at all. Garbage patches are huge! It’s difficult to determine an exact size as the trash is constantly moving with ocean currents and winds. The Impact of Garbage Patches on the Environment. Entanglement and ghost fishing: Marine life can be caught and injured, or potentially killed in certain types of debris. Lost fishing nets are especially dangerous. In fact they are often called “ghost” nets because they continue to fish even though they are no longer under the control of a fisher. Ghost nets can trap or wrap around animals, entangling them. Plastic debris with loops can also get hooked on wildlife - think packing straps, six-pack rings, handles of plastic bags, etc. Ingestion: Animals may mistakenly eat plastic and other debris. We know that this can be harmful to the health of fish, seabirds, and other marine animals. These items can take up room in their stomachs, making the animals feel full and stopping them from eating real food. Non-native species: Marine debris can transport species from one place to another. Algae, barnacles, crabs, or other species can attach themselves to debris and be transported across the ocean. If the species is invasive, and can settle and establish in a new environment, it can outcompete or overcrowd native species, disrupting the ecosystem. Garbage Patches and Human Health. We don’t know whether, or how, garbage patches are impacting human health. Generally speaking, we know that humans may be exposed to microplastics from a number of sources, such as seafood, sea salt, tap water, beer, and even honey. However, we do not know how or if humans are impacted by this. Plastic microfibers can also be transported in the air and found in household dust (e.g., from furniture, carpet, clothing etc. ), so exposure from seafood and other ocean sources may be small in comparison. The research community is actively exploring this issue. Marine debris in garbage patches can have other impacts. For example, it may also cause damage to vessels and be a navigation hazard. Marine debris can be difficult to see in the ocean if it’s floating below the water surface. A boat moving through the water can hit the debris, possibly resulting in costly vessel damage. Nets can become entangled in propellers and clog intakes. The answer is that we do not know. The locations and sizes of these garbage patches are not likely to change very much any time soon. However, the amount of debris may continue to grow as more and more debris enters our ocean each year. This growth will likely worsen current impacts on the environment, navigation, vessel safety, and the economy. How Do We Get Rid of Garbage Patches? It may not be possible to entirely get rid of garbage patches. Some of the material will take a very long time to break down in the environment, while other materials, like plastics, may never fully go away. Large debris, like fishing nets, can be removed by people, but debris in the garbage patches is also mostly made up (by count) of plastic pieces smaller than 5mm in size. The debris is also continuously mixed by wind and wave action and is spread from the surface all the way to the ocean floor. Since these microplastics are so small in size, constantly being mixed, and spread out, it would be very difficult to remove them. Finding a cost effective technological solution which can take on these challenges is an extremely daunting task. Unfortunately, we will be dealing with this problem for the foreseeable future. Here at the NOAA Marine Debris Program, we focus on marine debris prevention and removal from shorelines and coastal areas where debris is easier to pick up. Prevention is key to solving the marine debris problem over time. If you think about an overflowing sink, the first step before cleaning up the water is to turn the tap off. That is exactly how prevention works. By acting to prevent marine debris, we can stop this problem from growing. To prevent marine debris, we need to understand where it is coming from. It’s hard to identify specific sources, but we know that marine debris can enter our waterways and ocean in a variety of ways. Ineffective or improper waste management, dumping or littering, and stormwater runoff all lead to marine debris. If we want to "turn off the tap," everyone, including government, businesses, and people like you, will have to make some meaningful changes. We are the problem, and so we must also be the solution.